During his confirmation hearing, Rex Tillerson proposed an audacious move against China in the South China Sea. Rex Tillerson, U.S. President-elect Donald Trump’s nominee for secretary of state, presented a proposal for what the United States should do in the South China Sea disputes on Wednesday that you don’t hear often — even among China hawks in the United States. Speaking at a confirmation hearing the before the Senate Foreign Relations Committee on Wednesday evening, Tillerson remarked that China’s actions in the South China Sea — where it has most recently drawn attention for building seven militarized artificial islands in the Spratly Islands — were “akin to Russia’s taking [of] Crimea” from Ukraine. Tillerson alleged that the current administration had responded inadequately to China’s actions in the South China Sea. “The failure of a response has allowed them just to keep pushing the envelope on this,” Tillerson said. He added that the “entire global economy” would face negative consequences should China successfully interdict freedom of navigation in the South China Sea. There’s a lot to digest in Tillerson’s brief remarks about the South China Sea on Wednesday. First, the proposal to actively interdict Chinese access to dispute features current under its occupation would be a drastic departure from status quo United States policy in two major ways. The United States currently does not take a position on the sovereignty of individual features in the South China Sea. This is true even of features claimed, but not controlled, by the Philippines — a United States ally. If Washington were to interdict China from accessing its possessions in the South China Sea without doing the same for the other claimants — a group including the Philippines, Vietnam, Malaysia, Brunei, and Taiwan — then it would be discriminating on the legitimacy of specific claims. Second, using the U.S. Air Force and Navy’s might to interdict the Chinese People’s Liberation Army-Navy (PLAN) and People’s Liberation Army-Air Force (PLAAF) in the South China Sea would be a direct challenge to what China perceives as two of its so-called core interests — territorial integrity and sovereignty. Under the Obama administration, starting in October 2015, the United States used naval vessels to assert freedom of navigation in the South China Sea for military vessels, but does not actively disallow Chinese military vessels passage in any area of the South China Sea. Though the United States hasn’t itself ratified the United Nations Convention on the Law of the Sea (UNCLOS), China has, even if it regularly does not comply with UNCLOS in the South China Sea and elsewhere. The U.S. Navy effectively treats UNCLOS as the basis of customary international law. Under Tillerson’s proposal, the United States would likely be in violation of freedom of navigation requirements under UNCLOS, given that no part of the South China Sea is part of the United States’ own territorial sea or contiguous zone, where it could legally restrict the navigation of third parties. Even if China’s sovereignty over features currently occupied by its forces in the Spratlys and Paracels is unresolved under international law, a ruling by a Hague-based tribunal at the Permanent Court of Arbitration last year found Beijing’s capacious nine-dash line claim invalid under international law, among other findings. Despite that ruling, the United States would have no reasonable legal basis for interdicting China. Not only would the move proposed by Tillerson erode U.S. support for rules and norms in the South China Sea, it would make a conflict with China in the area that much likelier. Notably, Tillerson’s South China Sea proposal goes beyond any measures recommended by Trump himself in the area. Trump has been exceptionally critical of China, but primarily in the realm of economics and trade, accusing Beijing of unfair trade practices and currency manipulation. It’s unclear where Tillerson got the idea to recommend the United States interdict Chinese assets in the South China Sea. Make no mistake: Tillerson may be novice in the world of international diplomacy more generally — and certainly some of his answers at his confirmation hearing demonstrated this — but he isn’t completely new to the South China Sea disputes. The Wall Street Journal discussed the specifics of Tillerson’s exposure to the South China Sea in December, shortly after he was nominated. 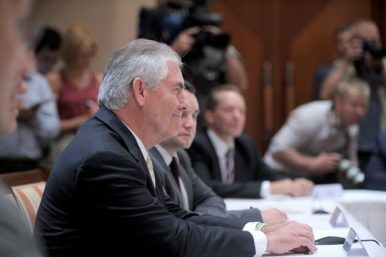 As CEO of ExxonMobil, Tillerson was involved in navigating a deal with the government of Vietnam to drill for natural gas in areas of Hanoi’s exclusive economic zone that overlap with China’s claimed nine-dash line in the South China Sea. In 2009, Exxon acquired rights to explore “more than 13 million acres off the coast of Vietnam,” according to the Journal. If Tillerson does end up successfully receiving Senate confirmation, China will no doubt be anxious of the incoming administration’s plans for the South China Sea. Tillerson’s comment will be seen as a vindication of the views of many in China that the United States seeks exclusionary hegemony in the South China Sea and that the Obama administration’s “freedom of navigation” framing has simply been a cover for this goal. To date, tensions between the U.S. president-elect and the Chinese government haven’t flared directly in a significant way, but there is great concern in Beijing about Trump’s possible intent to follow up on his threats of imposing high tariffs (which could lead to a trade war), reviewing the United States’ One China policy, and now, potentially revising Washington’s stance on the South China Sea disputes. If perceptions stick in China that the United States will intensify its bid to harm Beijing’s “core interests” — especially territorial integrity and sovereignty — the odds of a skirmish and outright war become all the greater.